The craziest thing happened last night. After our shift (around 1am), my supervisor and I went to the Lido deck because he wanted some pizza. On our way back to the crew cabins, we walked along the open deck (you know how much I love the night stars and ocean) and saw the strangest thing. Now, I must preface this next sentence with some information. When we are in port, birds enjoy being social on the ship. When we set sail, we leave with some feathery stowaways. Sometimes they might be injured and unable to fly back to the shore, maybe they just weren’t paying attention when the ship left and then by the time they noticed we were moving they were too far away to fly back to shore. I’m not sure what birds think about (I’m assuming not much), but regardless of their motivation, they need to sail with us until we get to land again. Usually there’s a few of them, maybe a dozen. Last night as we were walking, we saw two fly into windows right in front of us, one right after another. One I tried to pick up and rescue, then thought about it again and realized that wasn’t a very clever plan. I’m in no way equipped to nurse a stunned bird back to health, and also, birds are dirty. So we kept walking and I looked up and saw a CLOUD of tiny little birds. Seriously! At least a hundred of them, with all the chirping it sounded like daytime!! I felt as though I was in an Alfred Hitchcock movie!! I’ve never seen so many lost birds in my life. 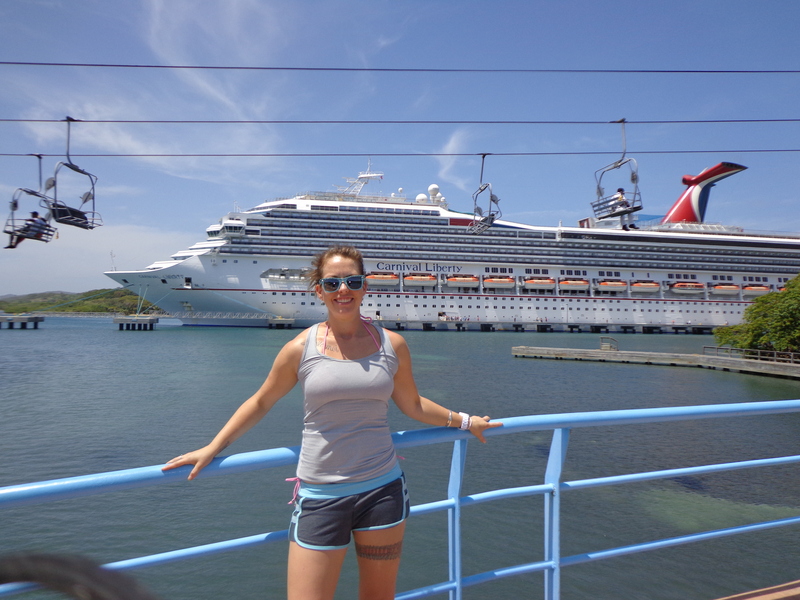 So today we docked in Cozumel and I’m hoping that some of them made it off the ship safely!! Maybe I’ll check after work tonight!! Speaking of crazy animals! I totally forgot to talk about the size of the iguanas in Grand Cayman. I didn’t get a good enough photo of them to post, mostly because I was gawking at the outrageous size of them!! They are MASSIVE!!! There’s a bunch of little ones, but then you see these iguanas on people’s lawns that have bodies the size of dogs. Not small dogs either. Medium sized dogs. Like the size of a cocker spaniel. Seriously. And their tails are almost double the length of their bodies. It’s outrageous!!! I even saw a small one swimming. 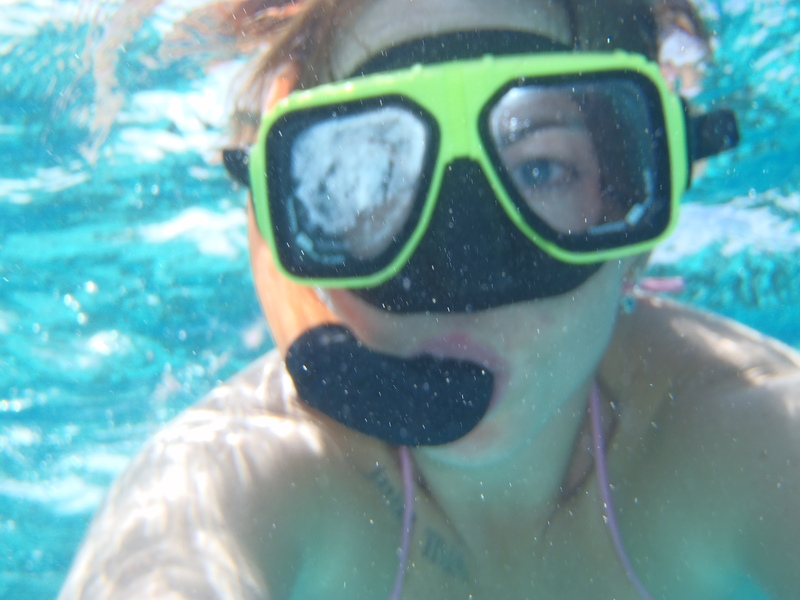 SWIMMING!!! Not quickly, but efficiently. They cover lawns, like COVER. We literally saw a hundred or two of them. It was so insane. I’ll try to take a photo of them next time I’m there!! I’m not really sure why I didn’t post these photos sooner. I think I forgot I had them! 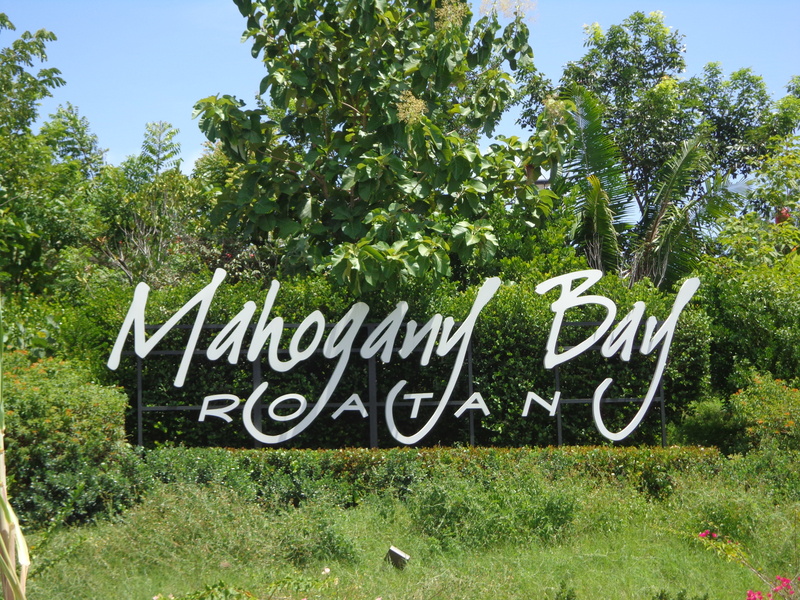 These are my photos from Roatan!! Absolute paradise!! 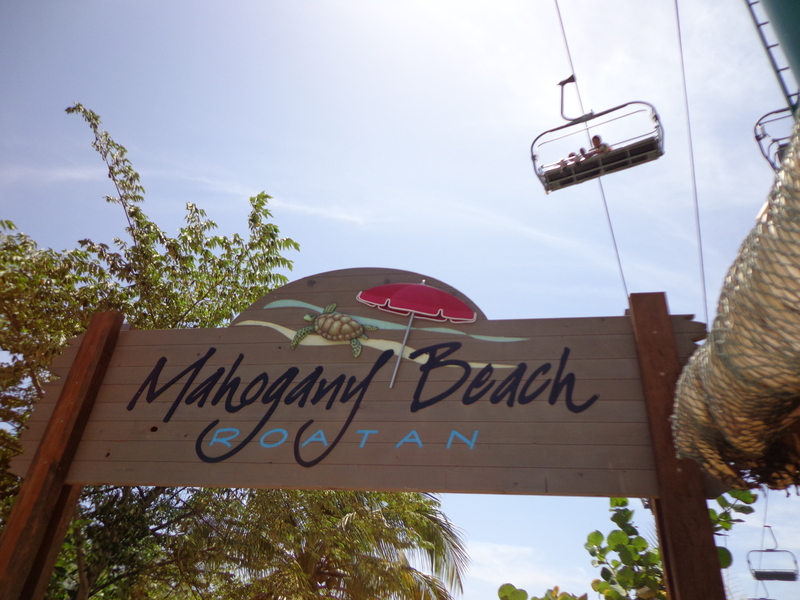 The beach sign with the chair lift behind it! It’s funny how time passes here on the ship. It’s a strange juxtaposition of time passing really quickly and really slowly all at once. As far as the outside world, it feels like we are trapped in a black hole, I have no idea of how quickly or slowly time is passing in the real world, because we are so disconnected. Sure, I have the time and resources to skype and blog and update all my crucial social networks, but that’s not the same, and internet time is so precious that you only do the important things. Gone are the days of streaming my favorite TV shows or texting my friends daily to see what’s happening. Ship time, however, is a whole different thing. Days pass so quickly here because we work so often, and have so much to do in the hours we work, that before you know it, a whole cruise has passed (a week, in my case). Even typical human interactions feel sped up. When you start a new job in the real world, it usually takes a while before you feel really comfortable and develop friendships. On board, the people you work with are the people you eat/sleep/work/play/work out with as well. You make friends very quickly because you are surrounded by these people 24 hours a day. Obviously you get along better with some people than others, that’s just human nature. I already have several close friends onboard and one of them leaves in 4 cruises, I’m not sure what I’m going to do without her!! In the next month, our crew will be completely changing. There’s 4 people who are over their 6 month contracts and will be going on vacation, so by the time I’m finishing my second month, almost the whole team will be different!! I’m just about to change rooms and move in with my paisana from Ottawa!! She’s lovely, I think we will get along very nicely as long as we abide by the two major house rules: no talking politics, and no talking hockey! #1: You know you’re going to get back on the ship in time, because everyone on the tour is from the ship, so there’s no danger of you missing it. #2: If something happens on the tour and you are delayed getting back to the ship, the ship will wait for you whereas if you just wander off and don’t come back in time, you’re out of luck. #3: The tour companies are all Carnival tested and approved, which means you needn’t be concerned about getting ripped off or robbed or kidnapped. 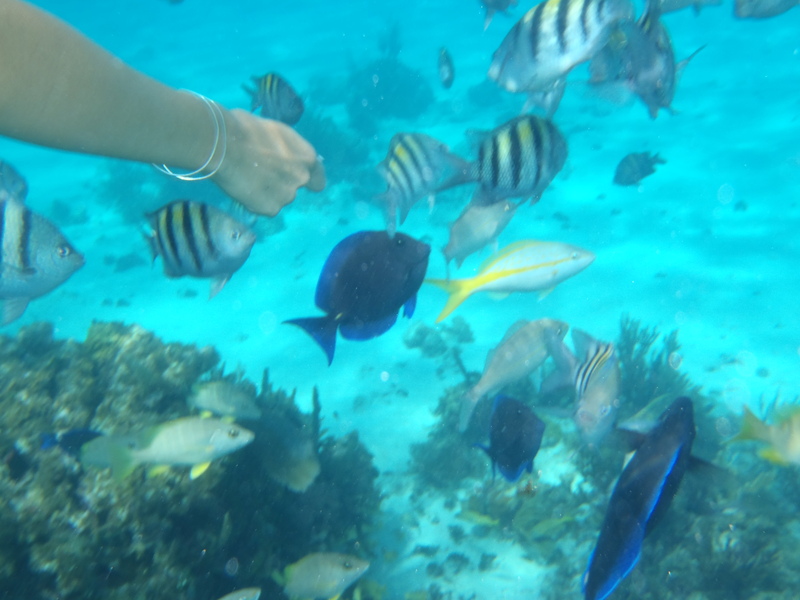 I went on the Coral Garden and Stingray City tour. We took a bus to a boat, which took up out into the ocean to adventure. 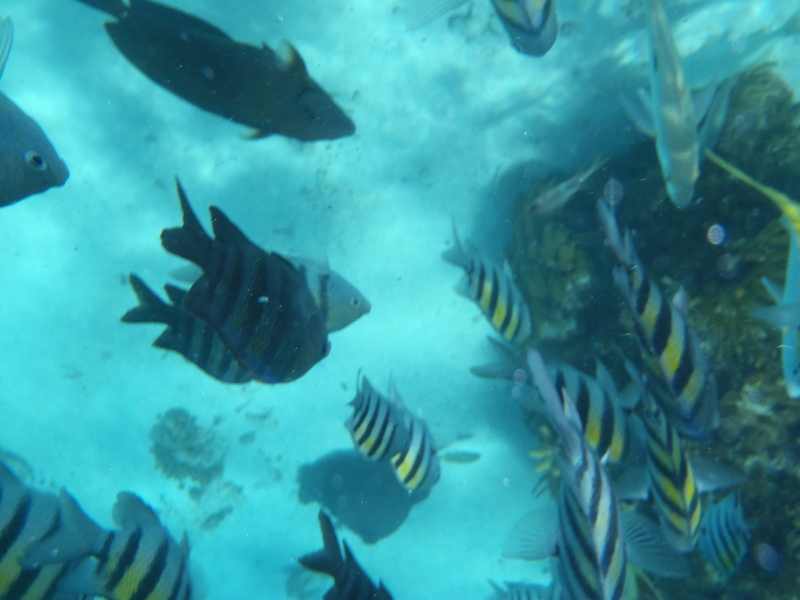 First we stopped to snorkel at the coral garden, which was beautiful and full of really pretty fish. Then we continued on to STINGRAY CITY!!! It was so amazing. 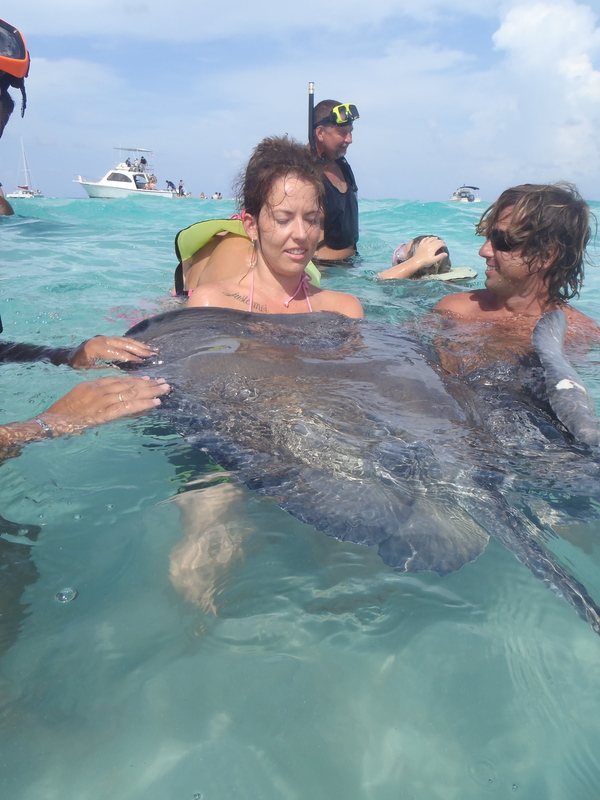 There’s dozens of stingrays and they come right up to you and let you hold them and stroke them!! Apparently what happened is that fishermen used to gut their fish in that area after a long day of fishing. Eventually, the rays caught on that every day there was a free meal raining down from the sky. So they started coming around every day, and more of them came. Eventually, the rays got used to being around people and being fed every day. So now that there’s no fishermen feeding them, they live off the tour groups that come through. The guides knew all of them by name!! They were surprisingly cuddly!! It was such an amazing experience and the water was so warm and blue, I absolutely loved it!! I can’t wait to go on more excursions to new amazing places!! As you know, I’m determined to see everything possible during my contract! I just want to see the whole world! Well this week I managed to make it outside in every port! Even if just for a little while! I almost didn’t go out in Belize because I didn’t have too much time and everyone told me not to go because it’s dangerous, unless you’re on an excursion. I loved it out there! One of the other girls and I went to a little shopping, she wanted a new dress and I wanted a loofah sponge. I know, right, how did I forget to pack a loofah!? When our friend heard we were going into the wilds of downtown Belize by ourselves, he took it upon himself to be our bodyguard and come along, which, although unnecessary in my opinion, was very sweet of him. We just took a cab to a shopping center and wandered around. It was lovely. I don’t doubt that it can be dangerous, but if you’re a smart traveler, you can avoid most dangers. We didn’t feel scared at all. Obviously I wouldn’t go wandering through the rougher parts of town by myself wearing jewelry and fanning myself with money, but the downtown area is quite nice and there’s a lovely little open air craft area type of thing that’s right by the port and has the usual touristy fun stuff to buy. I never really feel scared in those kinds of towns, you just have to be aware, that’s all. It reminds me of Barbados a bit. 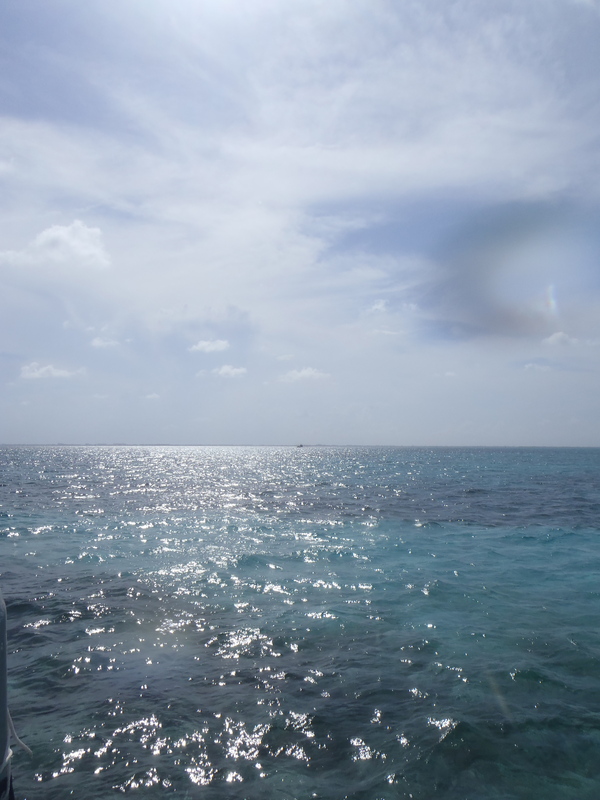 Belize is a tendering port, which means that the ship has to put down anchor just outside the port, and to get there you have to get off our ship, and get on a boat (a tender boat) that takes you to the dock. 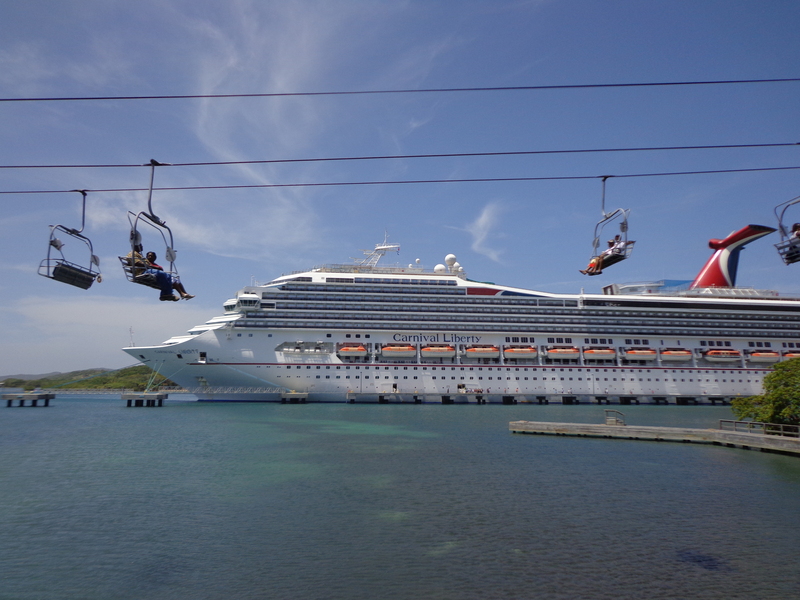 On the western Caribbean cruise, we have 2 such ports, Belize and Grand Caymans. On the eastern Caribbean, just one port is tendering, Half Moon Cay. Anyhow, the moral of the story is that Belize is nice. 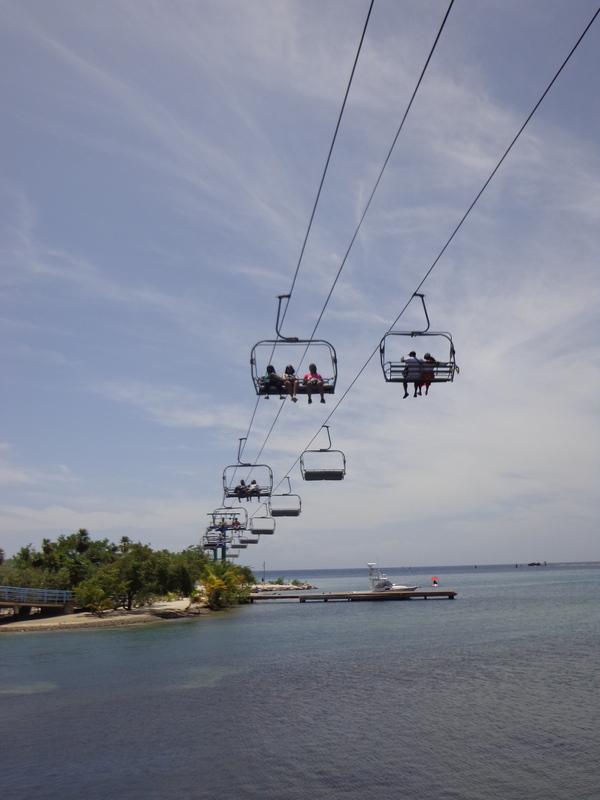 Next week perhaps if I have time I will try to go on an excursion in Belize so that I get to see more of it!! I also don’t have any photos of it because I didn’t bring any electronics with me at all (just to be safe). Now that I have a better idea of what it’s like out there I will bring a camera next time! I am currently sitting in the lobby of my hotel, waiting for my shuttle to come to take me to Port Canaveral, where I board the Carnival Ecstasy for training. By shuttle, I mean giant bus. More and more people are slowly joining me, the bus should be here any minute. I’m having a last minute panic attack because when I crossed the boarder, the customs officers didn’t stamp my LOE (letter of employment), and I kind of feel like they needed to. But maybe they didn’t. I probably shouldn’t question them, it is their job. I’m not even sure why I think I need some kind of stamp, but I just do. I think I just get worried when something is out of my control because I’m hyper organized and if there’s something I can’t organize, I worry that it’s wrong. I guess we’ll see in a few hours!! Fingers crossed for me that I get on my ship! I don’t know what my Internet situation will be like when I get on board, but I’m assuming spotty at best. I’ll keep writing and post when I can!! Bon voyage everyone!! 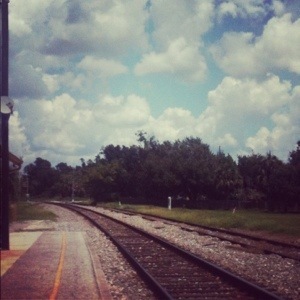 Yesterday I boarded a train in downtown Kissimmee and rolled on into Miami. The Amtrak was lovely, it took 5 hours to get here, there was also a 7 hour train that made more stops, but I figured 5 hours was a better amount of time to spend on a train! The train ride itself was uneventful. I dozed and stared out the window, then dozed some more. When I arrived at the lovely airport DoubleTree by Hilton, the front desk agent didn’t have me in her system, nor was my name on the list of Carnival crew members departing today. So naturally I was concerned. The front desk agent was so helpful, she checked me in anyway and gave me a number to call Carnival to see if they had anything to say about it. The night staff at Carnival didn’t really know much. They told me to call back in the morning to talk to the main office, but that I was definitely not assigned for today. Sasha (my new best friend at the front desk) said not to worry, she would be back on the desk at 7am and I could come back down and we would call again! I emailed my friend Andrea who is on the ship right now and she said the Ecstasy (my training ship) is only in port on Thursdays and Saturdays, so it wouldn’t make sense for me to be starting today. So that made me feel better!! This morning I scampered on down to the front desk and called Carnival again and the very helpful lady said that I board tomorrow!! Crisis averted!! So now I have a whole extra day of giant hotel bed and shower and freedom,. Tomorrow I move to the land of tiny beds and showers and living on a ship!!!!! 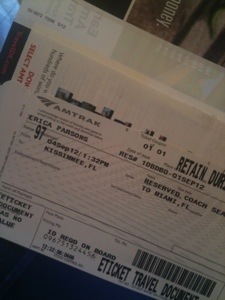 Now that I have a whole day in Miami, I might take the hotel shuttle into downtown, or to South Beach, or somewhere. But for now, I’m going to relax a little bit more, I want to be at my best for tomorrow!! Well here I am, in the Sea-Tac airport, gate B. I’m pretty sure I’ve spent at least 20 hours in this particular terminal, it always seems to be the one I fly out of. I’m so very excited to be off on a new adventure, I can’t even explain it. It was definitely hard to say goodbye to all my friends in Victoria but I’ll be home soon enough and I’m just so beyond thrilled to be embarking on this journey. Now, if you’ve been following me for a while, you’ll know that almost every time I travel, I have a super amazing time in the airport/customs, and feel the need to go on and on about it. Well this is another one of those times, so if you don’t want to hear how much fun I just had in customs, maybe go ahead and skip to the bottom. You were warned! I got on the Clipper in Victoria, which is pretty much my favorite way to get into the US, I love the boat and the smell of the ocean and also seem to find really cheap flights from Seattle to Orlando. So the boat was a little bit late docking (9:50 instead of 9:30) and my flight was leaving at 11:30. Customs was a breeze, I showed them my letter of employment from Carnival and he wished me good luck and off I went So I skipped the light rail, which is usually one of my favorite parts of Seattle, and caught a cab once I got through customs. I told my cab driver that I was scared I was going to miss my plane, and he totally rose to the occasion, he made the 30 minute drive to Sea-Tac in 15 minutes. No joke!! So I arrived and rushed to the United desk, checked myself in, and prepared to pay for my overweight luggage (whoops!!). The United attendant came over to take my money, looks at me, and says “That’s a lot of money ($25 for the bag, $100 for the overweight fee), why don’t you just put some things in your carry-on.” So I began to pull random things out of one suitcase and stuff them in my carry-on. I must have looked pretty tragic because after about 40 seconds of watching me struggle with my luggage (I was rushing, worried about missing my flight), he finally just said, “Don’t worry about it, just give me that bag.” So I thanked him profusely and gave him my bag. But I didn’t get a luggage tag because I was supposed to be paying for the luggage so he calls his supervisor over to get my a bag tag and tells me quietly “Don’t tell her it’s over weight, just tell her you messed up checking in.” Which of course I did. So one bag tag later, I saved $100 thanks to my new friend and I scampered off to security. At security I learned something new, apparently not only can you not have liquids/gels over 3 ounces, but you can’t have more than a quart of them. Which I did. (whoops!) So I had to get bag checked and pull out all my random eye creams and whatnot. I chatted with the fellow checking my bags and after moving around my things a bit, he let me keep most of them, I threw out some random samples of moisturizer or something and with his well wishes, off I went again. Upon arrival at B5, I discovered my flight was delayed and so full that they were asking for people to check some carry-on luggage! So not only did I make my flight, I have time to blog AND I get to check my carry-on for free!!! BEST FLIGHT EVER!!!! And that brings us to right now! I’m sitting in the B5 terminal next to a power outlet waiting for my plane to arrive, soaking up all the free wi-fi that Sea-Tac has to offer, happy as a clam. I just love flying, I always have so much fun. I think partly it’s because I’m such a happy traveler that it’s hard to not get caught up in how excited I am to be going places, and then it makes people want to help me out. Getting ready to board my plane! I’m so very excited to be in Orlando in the morning!!! More updates soon! !